I have to share this wonderful cooking blog that I have recently rediscovered and fallen in love with. 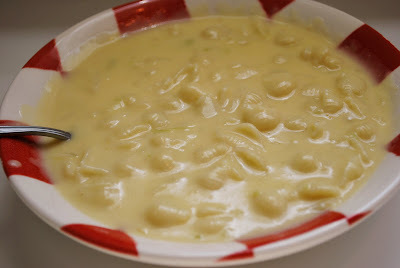 A friend sent me a link awhile back but I hadn't looked much and to be entirely honest, had completely forgotten about it, but when I was looking for new ideas recently, I started really looking through the site and realized what I'm been missing...cajun recipes, mac and cheese soup? Yes, please! I'm including photos and links to my 2 favorites (so far) but you can see everything she has to offer here! Mmmm...do I really need to say more? Seriously! I love mac and cheese...I could probably eat it every day, and this soup was even better! I loved it (though I didn't do the topping)! I've already made it several times, and it tastes great reheated too. This has definitely become a new favorite! I love shrimp, we have shrimp probably at least once a week most weeks. When I found this recipe, I knew I had to try it. I didn't add the sausage obviously since I don't eat meat, but it was delicious! My son ate it up too! I can definitely see this being a repeat!! So many I still want to try and I'm sure they will all taste just as wonderful!! Aw, thank you so much Randi!! Glad you are enjoying exploring the site a little more!